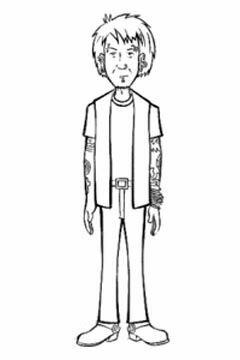 Axl is the Owner/operator of Axl's Piercing Parlor, a body-piercing and tattoo shop in Lawndale, featured in Pierce Me. 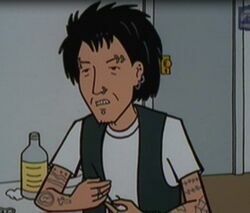 Axl has a scruffy appearance, speaks with a lower class British cockney accent, and has a casual regard for hygiene and for the law - in fact, based on his own guide to keeping tongue-piercings clean in "The Daria Database", he knows bog all about hygiene. (According to that guide, health insurance companies refuse to cover you if you get injured or ill from using his services). However, in Daria's Inferno, he speaks with an American accent. He has a good relation with Trent and Monique. His arguably funniest line of dialogue in that episode concerns the latter. Axl [to Daria]: You're 18, right? I should have asked. Axl: I'm afraid it does. This is a fully licensed establishment, acting strictly in accordance with the letter of the law. "The Daria Database" shows us just how unhealthy and dangerous his shop is. Axl rarely shows up in fanfiction, and rarely then in a good light. The low health standards of his shop cause Monique to get hepatitis C in "Smoking Mirror." He is a friendly ear and offers good advice to Jane in "Comforting a Confused Soul". This page was last edited on 16 January 2019, at 07:36.